Home » Annetarsia Knits » Rose City Yarn Crawl! Comments Off on Rose City Yarn Crawl! This weekend is the Rose City Yarn Crawl, with 15 LYS’s participating. Knitters from all over the place have been saving their money, planning projects and purchases – waiting for this event. Is there another city in the world with such a plethora of wonderful yarn stores as Portland, OR? I will be appearing at two stores this weekend, doing demos of Annetarsia techniques, signing books, answering questions, and checking out what knitters are purchasing and excited about. Can’t wait! Today I will be at the Naked Sheep Knit Shop, in North Portland. This is a delightful, cozy shop with a loyal and close-knit clientele. I love being there. Tomorrow, I am visiting For Yarn’s Sake, in Beaverton. This is a large store with so much yarn and inspiration all around, that I think of it as knitting Nirvana. I will be at each store from 2-5pm – Naked Sheep on Saturday, For Yarn’s sake on Sunday. Coming with me will be “Ziggy Zaggy” in progress. I’ve started the first zig zag. I haven’t buried any ends yet, I will be demo’ing that for knitters this weekend. 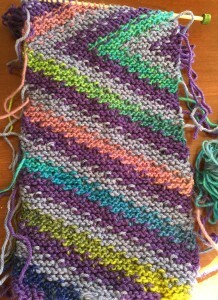 The pattern is starting to show, but it will continue to reveal itself as I knit. Intarsia garter stitch is so much fun to knit! Happy RCYC, everyone! Hope to see some of you, be sure to say Hi!